On pace: Ending veteran homelessness in D.C.
Alan Banks is an Air Force veteran who experienced homelessness for 6 years. Now, he's working with others to end veteran homelessness by 2015. WASHINGTON — Alan Banks is an Air Force veteran and father. In 1996 he was married and making six figures in security and law enforcement when he experienced something he never imagined. “I had a very good income, a home built, a lot of nice toys and was living life very well,” says Banks, a D.C. native. But Banks struggled with depression all of his life, and when his dad died suddenly that year, he lost everything. “That just was the trip that took hold of me; I just wasn’t able to recover from it,” he says. “It wasn’t that I made a conscious decision to stop working … it’s just what happened to me. Banks lived on the streets of D.C. for three years and in an out of shelters for another three. His daily routine no longer revolved around meetings, sporting events and socializing with friends. His focus shifted to what he was going to eat and where he was going to sleep. Banks worked hard to get out of homelessness and eventually got back on his feet. He found a job and an apartment; he built a savings account. But one night we was robbed and shot, an incident that eventually put him back on the streets. Banks’ story is not uncommon. The U.S. Department of Housing and Urban Development estimates that 57,849 U.S. veterans are homeless on any given night; 589 in D.C.
By 2015, the Obama Administration, the Department of Veterans Affairs and a number of agencies and organizations aim to reduce the number of homeless veterans to zero. Achieving that goal is becoming more realistic for the District. In August, 2013, Veterans NOW, a group of nine community organizations and local and federal partners, launched incremental campaigns to get veterans off the streets and into supportive housing. The group estimates that 1,625 veterans need housing assistance to end veteran homelessness in D.C. by 2015. “When we say ending homelessness, what that means is no one is going to be on the streets for years anymore, and that when someone newly becomes homeless or experiences homelessness, because it’s always going to happen with economy and with circumstances, is that we have enough services and wrap-around resources to end that quickly,” says Jill Carmichael, division director of Housing First at Friendship Place, one of the organizations that’s part of Veterans NOW. Between August and November 2013, Veterans NOW housed 207 veterans (including 96 chronically homeless veterans); from December 2013 to March 2014, the group placed 202 more veterans in homes (103 chronically homeless veterans). The numbers from its third campaign will be released soon. 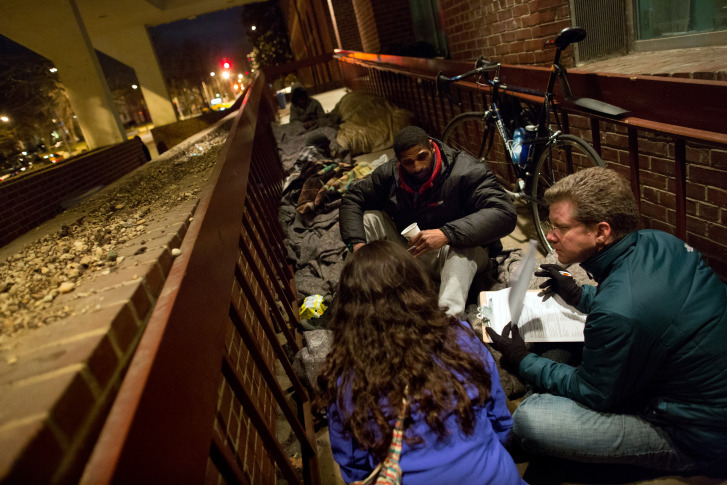 “[D.C.] is definitely on the higher end in terms of numbers of veteran homelessness,” Carmichael says. It happens for a variety of reasons. “You come back and there’s untreated mental health, PTSD, trauma … I think going through all of your resources and your support system, eventually you end up in that place where you don’t have anything left,” says Carmichael, who adds translating military skills to the civilian workforce also is challenging for some. The National Coalition for Homeless Veterans says the extreme shortage of affordable housing and access to health care also contributes to homelessness. Fixing chronic veteran homelessness is not as simple as removing veterans from the streets and placing them in homes. Veterans NOW assesses each person’s needs and decides whether rapid, short-term housing is best, or permanent housing with support from a case manager is needed. Banks, who is no longer homeless, calls the case manager the most important part of permanent-supportive housing. The role of a case manager is to help with everything from making medical appointments to reintroducing veterans to a life they once knew. “When you’ve been homeless for a long time, you forget how to live ‘the normal life.’ You forget how to grocery shop; you forget how to do your laundry, how to keep appointments — things like that,” Banks says. “It helps people who have been in and out of the ER, who have been homeless for years, get the care that they need to address those issues,” Carmichael says. The number of young homeless veterans constitutes 8.8 percent of the overall homeless veteran population, but that number is growing, the National Coalition for Homeless Veterans reports. About 12,700 veterans of Operation Enduring Freedom, Operation Iraqi Freedom and Operation New Dawn were homeless in 2010. “Vets, particularly those who served in combat, are coming back disconnected from society,” Banks says. Carmichael says Veterans NOW uses a coordinated entry system to determine which homeless veterans receive housing first — similar to a triage system in an emergency room. Kurt Runge, director of advocacy at Miriam’s Kitchen, another organization that’s part of Veterans NOW, says the model adopted by the coalition is applicable to more than just veterans. “Not only can we end chronic veteran homelessness, but we can end all homelessness,” says Runge, who says that most of the chronic homeless population is in their 50s with a life expectancy of 62. “When people are homeless, they’re thinking about survival, not when they’ve seen the doctor last. Wounds fester; illnesses grow more severe and people die young. That’s why housing for this population is so critical,” Runge says. Four years ago, Banks overcame homelessness once again. After waiting for a year on a list for veteran housing, Banks met Geoff Millard at Friendship Place. Millard cut through the red tape and had Banks in an apartment in a week. Now, Banks lives in Northeast D.C. and works at Friendship Place as a community engagement coordinator. “That’s a fancy way of saying I try to encourage people in the community to help people,” he says. While support from organizations such as Friendship Place and Miriam’s Kitchen help in the fight to keep returning military members healthy, Banks says more needs to be done, and that counseling needs to happen before soldiers are released.